Just ordered THIS high-performance commercial blender from Amazon.com.. I picked up a new cutting board today, a flipper for grilling for my son's new grill, and a knife/scissor sharpener. Love that spatula & cutting board!! Smoothies, Here I Come!! New blender came today!! Got this to use as a veggies steamer & rice cooker. Also sautés! Thinking about getting THIS stand mixer. Kitchenaid is no good any more!! This one has a 3-year warranty. KA ga5rrantees their mixers for only 1 lousy year!!!@! Last edited by Shermie; 05-15-2018 at 06:38 PM. Someone said that the front of it looks like Gort, the robot featured in the original film, The Day the Earth stood Still!! Hah!! Shermie, someday you'll have to post photos of all these kitchen toys in the places you store them! I will when I get it set up. Here are pic of it. I'll make something with it to bake when the heat wave is over. Here's my latest set of new kitchen toys! 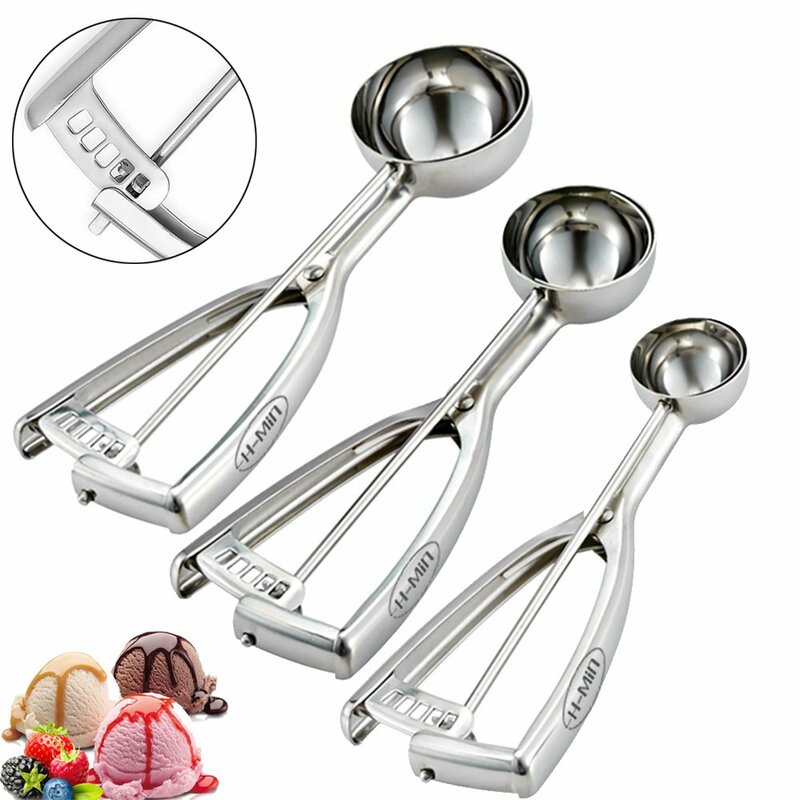 A set of 3 ice cream scoops - each one a different size. The next batch of cookies will be distributed out evenly. What are the sizes? Do you have a link? It just says Small, Medium & Large. I got them from Amazon.com, if you want to try to find out more. The small one should give me nice size cookies! Good work!! Now I just want a set or measuring cup with spouts to make it easy to pour liquids into the mixer's bowl! Last edited by Shermie; 07-15-2018 at 06:21 PM. Bought a spoon rest & THIS from BB&B the other day. Ordered 2 of these measuring cups & a set of toaster oven bakeware. Got these & a few more things!! Now cook some of that and show us your creations! I also have a stovetop smoker, in which I plan to smoke some meat soon. When I get the closet set up, I'll show you before & after pics of it. Shermie's going to look like you're going into the restaurant biz at your place.